Not sure about you guys, but lately my skin has been feeling a little less than perfect. The winter season has left it dry and dull and I’m on a mission to get it summer ready! One of my favorite ways to do that is by using this DIY brightening face mask! It’s soooo easy to make and really helps get my skin out of that post-winter rut! Plus, I love using all natural ingredients! Check out the super simple tutorial and make your own mask this weekend! Easter eggs, but make them fashion. That time of year is upon us, and I’m always on the hunt for a new, fun, and yet easy way to decorate my Easter eggs. There are some STUNNING tutorials out there on the web, but I’m not trying to spend a week creating one batch of eggs. Ain’t nobody got time for that. Today’s Easter DIY is simple with a capital “S”. It doesn’t require any dye, so no stained counters, hands, or large messes to clean up either. With only two supplies, you can make these cute DIY animal print Easter eggs in no time! I’ve gotta admit, I have some AMAZING girlfriends in my life. And, although I try to make sure they know how much I appreciate them and their friendship throughout the whole year, I’m alllll about celebrating them for a holiday too! Plus, galentine’s day just gives me another excuse to hang out with them! If you’re throwing a galentine’s day soiree this year, these galentine’s day photo booth props are SO easy to make and take no time at all to put together! And they are SO cute! Using a few simple supplies and less than 30 minutes, you can create these fun DIY halloween movie night pajamas! Halloween is next week and you can bet that I wasn’t about to let it slip past me without hosting a spooky halloween movie night. October is the one month that I try to fit in as many make-you-jump movies as possible! Cue the popcorn, candy, and vampire bite drinks! (More on those later this week). But, a halloween movie night wouldn’t be complete without PJ’s! And not just any pj’s…I wanted to give them a halloween twist! Using a few supplies and less than 30 minutes, I made some fun DIY halloween movie night pajamas for each of my girlfriends to wear for the party, but they also double as fun take home gifts too! Because, squad ghouls! This DIY Halloween movie night invitation is a cinch to make and is a great way to get your guests in the spirit (no pun intended!) Check out the easy tutorial! This DIY Halloween movie night invitation checks all of those invitation boxes and is really easy to make too! This fall DIY floral pumpkin arrangement is easy to make and can be created in less than an hour with only a few supplies! I love a good DIY project that has multiple functions. And by multiple functions, I mean one that can seamlessly transition between holidays. 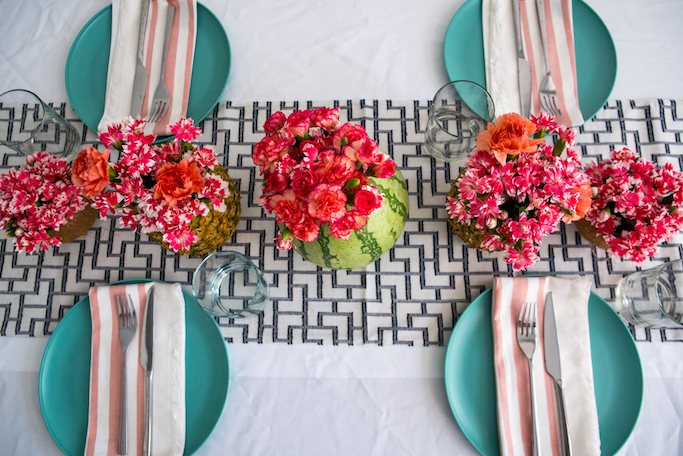 This DIY floral pumpkin does just that! It can happily fit into early themed fall decor in September, follow on through with Halloween in October, or even make it onto the table for Thanksgiving in November. Whichever holiday or season you plan to use it for, this beauty is really easy to make and can be created in less than an hour! I’m flying out to sunny LA today to celebrate my little sister’s birthday. She’s turning the big 3-0 and we’re celebrating with surf, sand, sips, and some fun adventures along the way (like a wine safari…who knew?!) Bring on the palm trees! 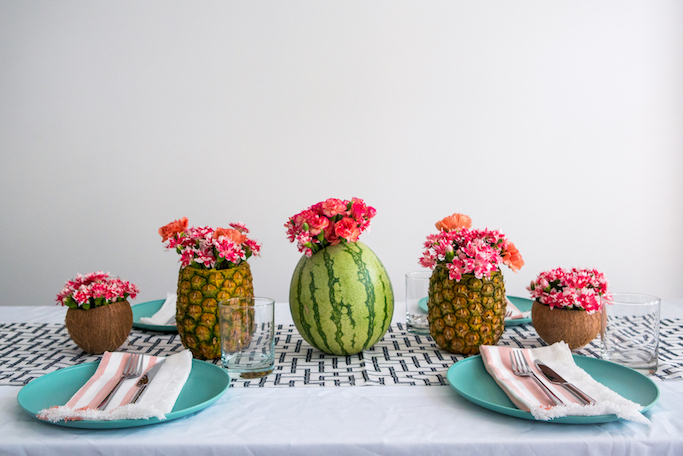 Because I’m feeling a little tropical lately, I wanted to share an easy way to bring a little tropical flair to your next event. 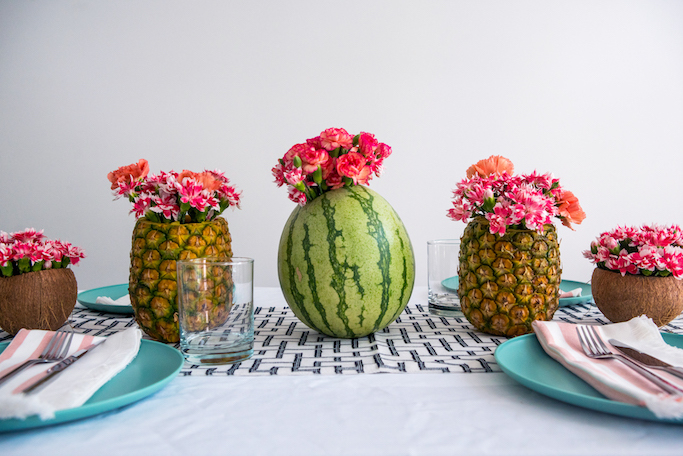 These DIY fruit vases make the prettiest little table centerpiece when lined up together, or a fun statement when displayed apart. However you choose to display them, they’re so much fun!